Rainy weather forced the change of location however did not stop people from coming to the BarCamp Prishtina #15 which gathered more than 60 atendees at Innovation Centre Kosovo. 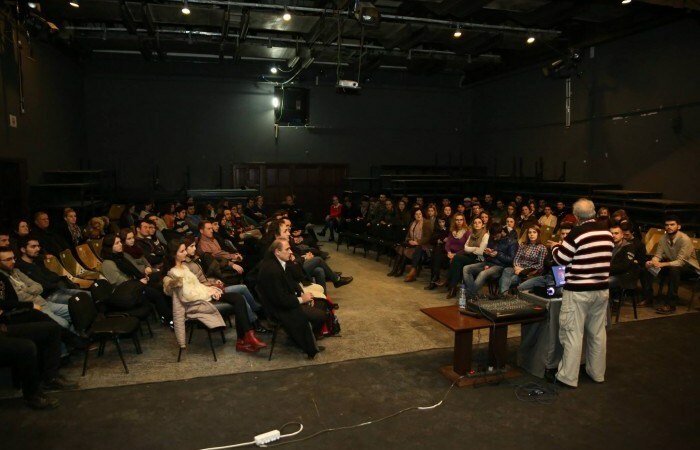 This event brought in one place four speakers from Levizja FOL, Ministry of Integration, “Zeri” newspaper, and STIKK. Fidan Kalaja and Dritëro Arifaj were present to present details of Open Government Partnership. Arbana Xharra talked about the challenges she faces in her career as one of the most known journalists in Kosovo. Meanwhile, Valon Canhasi from STIKK presented briefly the latest report on Internet Penetration and Usage in Kosovo. Fidan started the BarCamp talking about process of Kosovo’s membership in the Open Government Partnership. His presentation was based on a timeline of the whole process until now. As Fidan explained it, the idea of membership in OGP came in 2010 when Government responded negatively to a request of Levizja FOL to access the documents of highway construction. This was an inspiration for FOL to advocate on Transparency Standards, and this was a push to introduce them to OGP. The OGP became official on September 20th, 2011 and a year later Levizja FOL begins preparations by analyzing procedures. Finally, in 2013 Kosovo Government decides to initiate the application process for membership in OGP. Kosovo is together with 8 other governments around the world in this initiative. Application for OGP was done simultaneously with Croatia and both countries helped each other in the process. Dritëro from the Ministry of European Integration talked about the Government role in the process of OGP and what the Government is currently contributing. Government has creating a working group which is institutional meaning that when decisions have to be taken related to OGP, this working group has full authority. “Government’s aim wasn’t just to make Kosovo famous abroad but also to get the trust from its people by making information available with full transparency” he said. There are four goals to be achieved in order to get the membership and commitment, namely: Fiscal Transparency, Access on Information, Publish data of the public or elected officials, and Civil Activism. OGP helps improving public services, increasing public integrity, effectively managing public resources, creating safer communities and increasing corporate accountability. Arbana stated the challenges of a journalist in Kosovo by referring to her twelve years experience. She began her career immediately after the war and since then dedicated her time and efforts to this profession only. From a young journalist whose task was to read news from global portals she became one of the best known research journalist in the country with thousands of articles published by domestic and international media. Her first researched topic was on hemorrhagic fever – a disease taking many lives of Kosovo citizens. Soon, she moved to overbuilding in Prishtina after which article she also got the first threat. This was a change point in her perception about the profession she had chosen.She also wrote about abuses with municipal projects, tenders at government level, misuse of government budget to enrichment of politicians, and lately about religious extremism. This was a research that took eight months of hard work during which she personally interviewed people in Kosovo, Macedonia and England. The research documented growing extremism, suspicious funding, threats and attacks against religious opponents and was published in international magazines as well. To close this edition of BarCamp, Valon briefly showed main results of a survey on internet penetration and usage in Kosovo – a survey realized by STIKK. A detailed report of this survey is yet to be published thus BarCamp audience was among first to see the results. Findings of this survey were quite interesting raising the curiosity of the attendees who had many comments and questions related to them. Students of Universum College were contracted by STIKK to do the work while the good news is that about 76% of the Kosovo citizens have access or use the internet.